One of the biggest mistakes is to treat the sea as if it were an extension of the land. We tend to apply the same scientific principles and the same ecological laws, without realising that the marine environment is too strange for these laws to apply. Please read this chapter with care, and also the related pages, because it gives you a new understanding of how the sea works and why a century of ocean management has not delivered the expected results. Also take the challenge to read about our most recent marine discoveries with the DDA method. marine biodiversity The sea is a totally different place. How does it differ from the land? How many phyla and species? How does it affect marine reserves? How can marine reserves fail? Why has ocean management failed world-wide? The whole article covers about 0.35MB (30 pages), including text, drawings and photographs. For corrections and suggestions, e-mail the author. The sea is such a different place to live, that it is perhaps not possible to imagine how different, not even after years of diving and observing underwater life. Living in water is profoundly different from that on land. Take some time to read carefully what follows. Since this web site specialises on the marine world, good information can be found in other sections. Also look at the photographic library and classifications for images of marine organisms. The following summary of characteristics of the seas, may give an idea how different it is from what we experience ourselves on land. only one sea: whereas there are many unconnected continents and islands, there exists only one sea. People have given different names to parts of it, while also naming the large parts oceans. lowest point on land: the sea lies at the bottom of all land and civilisation. All the water and pollution ends up in the sea. life began in the sea: the sea is where life began, although the primordial seas were certainly quite different from those of today. Only a few creatures crawled onto land, to adapt to a much harsher environment. Yet today, all organisms carry inside them a body liquid which still resembles that of seawater. controls the planet, climate, water circulation: the sea is extraordinarily large and massive. As a result, it has a stabilising influence on the planet's temperature. It has a major influence on the climate everywhere and also on rainfall. Most of the rain falling on land, has originated from the ocean. seabed rocks and sediments are young: the constant forming of new tectonic plate material at the spreading mid-ocean ridges, and their continual subduction into ocean trenches, acts like a gigantic conveyor belt. As a result, the oldest rocks (basalt) found on the seafloor is no more than 200 million years old. By comparison, 3000 million year old rocks can still be found on land. Erosion on land has carved away old sediments and rocks in most places, but has exposed old rocks elsewhere. bulk of the planet's biomass: 90% of the planet's biomass is found in the oceans, because water is the most important need for life. life everywhere: life is found everywhere in the oceans because light shines into the oceans, and some nutrients are found everywhere. Also, the sea mixes its waters quite well. Everywhere in the ocean, at least 100 - 1 million cells can be found per ml. more natural: because humans do not inhabit the sea, plough its soils, build cities and roads there, the sea is far more natural than the land, even more natural than national parks where introduced predators and pests still roam freely, threatening native wildlife. accessibility: because the sea surface is a continuous flat, encircling the globe, it is easy to get anywhere by boat. Compare this to unpassable mountain ranges, river gorges and waterways on land. Even so, the sea is also difficult to study under water since this is a hostile environment to humans, as divers know. largest mammals: the largest mammals are found in the oceans, because they don't need to carry their body weight, and size gives an energy advantage with regards to cooling, migrating and hunting. knowledge: not being able to spend long times in and under the water, the sea has retained its mysteries far longer than the land which could be studied much more easily. So the knowledge of the sea is proportionally far less. Unfortunately, many people are unaware of the enormous differences between land and sea, and unknowingly make big mistakes. size of the oceans: seen from space, the oceans are Earth's major feature. sea is very large compared to land: The surface area of the sea is 71% versus land 29%, and it is on average about 4000m deep. The oceans consist of vast, uniform areas. However, when thinking of the Pacific Ocean as wide as a large living room (10m vs 10,000km), then the pool of water is only 4mm deep (4/1000m vs 4 km). Within these 4mm, everything happens - surface currents, deep currents, upwellings and so on. The deepest trenches are only 10mm deep! 3-Dimensional: unlike forests, which extend in three dimensions by the strength of their trees, the sea stretches in three dimensions on account of the density of the water, which carries the organisms. Unlike forests, which may reach 40-60m height, the sea reaches down to 10,000m, and contains life at all depths, with a 'canopy' of microscopic plants close to the surface. connectivity: connectivity creates stability. Oceans have very stable and often ancient communities, particularly in the sunless depths, where major global disasters do not penetrate (meteorite impact, ice ages). less isolated: all seas are interconnected, and in theory, all organisms could migrate to every other place in the sea. However, in practice, seas do have regions and many marine organisms are endemic, although less so than in the terrestrial world, which is highly fragmented by comparison. homogenous: marine environments are more homogenous and stable, and are less patchy. food from elsewhere: sea water transports organisms (plankton, larvae), unlike air. Many marine habitats depend on adjacent areas for food and larvae. Organisms can survive by being stationary, while catching food that passes by. less endangered: because oceans are so well connected and large, they are thought to be less endangered than the land ecosystems. However, near the coast they are threatened by disturbance from trawl nets, and by pollution from land and industry. sea water: sea water is almost constant in its composition, but nutrients important for life, vary. Variations in temperature and salinity have profound effects. heat conduction: water has a high heat capacity and conducts heat quite well, also by convection (movement). It cools formidably. It is therefore impossible to be warm-blooded and breathe water as well. So all marine organisms are poikilotherm (assume the surrounding temperature). Note that whales and dolphins are warm blooded but they breathe air. temperature: the temperature of seawater stays quite equitable, unlike that of the air. Seawater at the poles is much colder than that at the equator, resulting in ocean currents to equalise the difference. Warm water is lighter than cold water. The coldest water is found at the bottom of the deep oceans. salinity: miraculously, the salinity of sea water is almost constant. Judging by the amount of salts carried by rivers over eons of time, the oceans should have been very much saltier, but somehow they shed salt continuously. Salty water is heavier than fresh water. density: water is about 800 times denser than air, reason that waves and tides can exist. The density of seawater also depends much on salinity and temperature, the combined effect of which leads to surprising phenomena such as sinking waters, upwellings and stratification. stratification: ocean water easily forms layers, with lighter (less dense) water on top. Boundaries between such water masses are called thermoclines (equal temperature) or haloclines (equal saltiness). chemistry: everything is present in small quantities. See composition of sea water. limiting nutrients: the most limiting need on land is water, which is of course plentifully available in the oceans. Nutrients limited on land are soluble nitrogen, phosphorus, potassium (NPK), followed by calcium, sulphur, magnesium (Ca, S, Mg) (see soil/fertility). Bacteria are capable of making nitrogen compounds from atmospheric nitrogen. In the ocean, the main limiting nutrients are phosphorus, sulphur, silicon and iron (P, S, Si, Fe). good mixing: although being stratified in many places, the oceans are mixed quite well by their currents, returning nutrients from the deep back to the surface by means of the large ocean conveyor belt and local upwellings. microscopic plants: the plankton ecosystems are a major feature of the oceans, with single celled microscopic plants ranging from the size of bacteria to almost 1mm. Larger planktonic organisms such as jellyfish can reach one metre across. filterfeeding: because of the availability of plankton, many organisms have adapted to filtering these and feeding from them. Many ingenious ways have evolved. This kind of feeding is not known on the land. productivity: even though all nutrients from the land end up in the sea, the oceans are only moderately productive. Dead organisms and even live diatoms, gradually sink. Decomposing bacteria are found at all levels, but in the end, nutrients sink to the deepest parts of the oceans, from where they are returned slowly by upwellings. Some places are very productive, like rain forests, yet others compare with deserts. tiny plants: unlike on land, the seas' main productivity comes from tiny plants called phytoplankton. Due to their small size, they metabolise and grow fast while using all available nutrients and light. These diatoms and dinoflagellates must be small in order not to sink to sunless depths. food chain: unlike on land, large fish cannot find plants large enough to feed on. So they depend on the lower hierarchies of the food chain which convert the sun's energy to ever larger food particles, from zooplankton to fish larvae to bait fish. Food pyramids in the sea are therefore necessarily much higher than on land. energy economy: marine organisms are very energy-efficient, since they don't need to keep warm, and often don't need to move either. They do not need to support their bodies and can swim easily by all kinds of means. It makes long food chains possible, and large food webs. highly productive areas: highly productive areas are found in estuaries (and salt marshes, mangroves), over the continental shelves and over oceanic upwellings. They are usually poor in species. continental shelves: these are the shallow margins around continents. Dead organisms sink only 40-100m down, and their nutrients are recycled seasonally (much like lakes do), causing one or two annual plankton blooms. ocean deserts: the open oceans outside continental shelves and slopes, outside upwellings, behave like a deserts due to their low productivity. Their area is huge. east-west differences: The east coasts of oceans (west of land) are productive but less diverse, due to upwellings, rich plankton blooms and cold water. The west coasts however, are less productive while being more diverse, due to clear and warm waters. long food chains: marine food chains are unusually long, having 5-7 trophic levels. predator fishing: humans are not harvesting the primary production (algae, like food crops), not even catching grazers (plankton feeders, like sheep) but top predators (like lions). This makes it seem that oceanic productivity is rather low. It also causes fisheries to collapse easily. reproduction: because of the water's carrying capacity, eggs and larvae are transported easily and over vast distances. Most marine species reproduce by eggs. However, some species fertilise internally, like sharks and rays. high fecundity: fish produce very large numbers of eggs. This apparent waste is necessary to produce food in the food chain from invisible phytoplankton to bite-sized parcels. One can say that fish reproduce primarily to make food (99.999%) rather than babies (0.001%). synchronised mass spawning: to increase the chance of sperm fertilising eggs, many marine organisms (corals, barnacles, limpets, etc.) synchronise their spawning. In this manner their juveniles swamp all other planktonic predators, becoming the main zooplankton for long enough to become successful. variable recruitment: because of the many vagaries of their juvenile planktonic stages, recruitment (becoming one year old), is highly variable from year to year. This also adds a complication to fisheries management. extraordinary growth: individual fish may grow from a 1mm egg to a 1m fish, over a billion times in volume or weight. During their fantastic growth, juveniles have to adapt to many different types and sizes of food. They do so without parental guidance. Terrestrial species have more prudent strategies. many species reproduce asexually: the sea has some ancient but successful organisms. Because many are able to reproduce asexually, a mating partner is not critical, and they can live far apart as rare organisms (anemones, corals). Some species grow their colonies by asexual reproduction, which guarantees that their offspring benefit from the favourable conditions of their parents (anemones). Some organisms grow this way (sponges). many species can self-fertilise: many species can fertilise themselves (hermaphrodites), which produces offspring slightly different, but very much alike (molluscs). It gives them enough adaptability. biodiversity: because all parts of the sea are interconnected, with ocean currents as highways between them, marine diversity is not as high as terrestrial diversity. For instance, the ocean-wandering jellyfish may comprise only 200 species. However, exceptions exist. old phyla: the sea has 18 phyla (the top of the species pyramid, where species are at the bottom) which are not represented on land. Thus 80% of the world's phyla are found in the sea, but only 20% of the world's species. Variety in phyla is often referred to as variety in body plans, because they comprise enormous differences in body form and function. seawater cools: seawater cools its organisms for 100%. They can't warm up in the sunshine (lizards) or exercise to warm up (insects, birds). As a result, biological productivity is low. As the temperature changes, the biochemistry (enzyme optimum) changes enough to introduce new species. Thus marine species variety is susceptible to latitude (north-south). sea diversity: 100 new species per 100km transect, or 1 new species/km2. sea bottom diversity: as scientists are expanding their knowledge of the sea bottom, they are finding species variety as high as 900 species/m2, which compares with that of tropical rain forest. The benthic deepwater species variety increases with depth to 1800-3500m in the Atlantic Ocean, but not in the Pacific Ocean. pelagic: pelagic environments are poor in species. rare species: rarity is more likely, due to the stability of the sea, its many ancient phyla and species, and their ability to live far apart, while living long lives. endemic species: marine species are less endemic (belonging to one place), thus are less prone to extinction. endangered species: very few on the endangered species list CITES. But many marine mammals are threatened. See conservation/marine mammals. oxygen/ CO2: oxygen is exchanged only in one place, through the ocean's surface, and CO2 goes this way too. In the shallow zone, where sunlight reaches deep enough, and only where there are enough nutrients, will oxygen be produced and carbondioxide used. At night, and in the deep ocean, the process reverses, leading to a shortage in oxygen at the deep sea bed. stratification: due to the combined effects of salinity and temperature, many places in the sea are stratified (layered), blocking the convection of water (up/down movement) and gases. It may lead to severe shortage of oxygen. salinity: the sea water is saltier than the body tissues of many marine organisms, and they lose moisture continually by osmosis. A fish must drink seawater in order to maintain a balance of body salts. wave action: whereas winds blow mainly in one direction, waves swing to and fro. In the shallows, they are very destructive, also because water is 800 times heavier than air. This has had a major effect on the shape and development of seaweeds. Wave action is also important fore mixing nutrients and exchanging gases. tides: the moon and sun tides are felt in the sea as a predictable rise and fall in sea level, accompanied by currents. Such tidal currents cause extensive mixing and distribution of pollutants and plankton in coastal waters. In the open ocean, tides are not noticeable. substrate on the move: everything on land has a fixed place. Plants are well rooted. In the sea only the rock surface provides reliable holdfast. Planktonic organisms are constantly on the move. The sandy and muddy seabeds are stirred regularly, forcing organisms living there, to rebuild their warrens and to dig deeper. substrate as attachment: because plants are surrounded by nutrients and water, they do not need roots and soil. They attach to the rocks and absorb moisture and nutrients direct through their entire surfaces. Other organisms can attach themselves likewise, because the food comes towards them by movement of the currents. decreasing light intensity: unlike on land, light intensity decreases rapidly with depth. In the coastal zone, plant life stops at 20-30m depth. The quality of the light changes too, becoming more blue. The light intensity and quality gradient gives rise to biodiversity and horizontally zoned habitats. (see light qualityand zoning, littoral zones eco3.gif, and eco8.gif). habitats: due to its unique nature, the sea offers new kinds of habitat, some of which are mentioned here. saltmarsh: the salt marsh is a stable brackish water habitat, densely vegetated and intertidal. It traps mud and thrives from its nutrients. It is highly productive. estuarine sand & mud: the sand and mud inside harbours is exposed to small waves, but protected from large ones that could rip it up. It thrives on the nutrients from the land and on the warmth of the water, leading to high productivity of plankton, algae and bacteria. rocky shore: the coastal rocky shore has an intertidal habitat, sometimes with rock pools. Below low tide it exhibits zoned seaweed habitats, depending on its exposure to waves. It is moderately productive. open ocean pelagic: lacking nutrients, this is a clear water, low productivity habitat. plankton: plankton with all its life forms, is found in all oceans. Water is its substrate. In the presence of high nutrient concentrations, it can bloom vigorously, darkening the water and giving rise to harmful algal blooms. deep sea floor: a very stable habitat, able to live in low oxygen concentrations but rich in slow growing and rare species. It has a low productivity, except in the presence of hot water vents. coral reef: comparable to rain forests, coral reefs have very high diversity and nutrient/energy recycling, but low overall productivity. 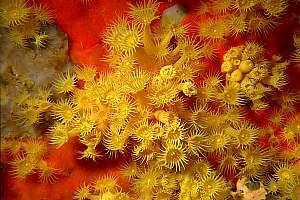 Corals provide the substrate and shelter for other species. polar seas: nutrients surface in certain places, but once a year causing blooms of plankton, with krill, and high density of life, but with low diversity. Because in summer the sun shines all day, the overall amount of light is high. Due to melting ice, there is diversity in salinity, causing special adaptations. sea is still more natural: because people do not live there, no habitat conversions have occurred, nor roads or housing developments. However, along the coast where people like to live, saltmarshes have been reclaimed and parts of estuaries. Causeways have changed the hydrology of harbours. trawling damage: trawling for finfish and particularly for clams and shrimps, has caused damage to the sea bed. However, in exposed shallow seas, waves do more damage naturally. sea is at the bottom of society: all pollution ends up in the sea. although the oceans are large, the coastal seas above the continental shelves are shallow and are not rinsed well because they are too deep for wave action. mud: mud from land erosion, agriculture, cropping, is easily stirred by waves and keeps polluting the waters after every storm or deep ocean swell. Many organisms are sensitive to mud, which suffocates them. nutrients: nutrients from farm fertiliser arrive with the mud, to fertilise the plankton. Heavy plankton blooms result, often with poisonous species, killing marine organisms and rendering beaches unsafe for swimming. sewage: sewage and treated sewage end up in the sea, sometimes making beaches unsafe from swimming. Its nutrients add to those coming from mud and farm fertiliser. biocides: biocides from farming, industrial chemicals and heavy metals cause the disappearance of sensitive marine creatures or stress marine environments. access and knowledge: in general, the sea is difficult to access, but once there, one can travel everywhere, not needing roads. access to the sea difficult: access is very difficult, particularly for going down. One can visit the shore at low tide, or use SCUBA gear for diving. Almost always is a boat needed. A small part of the sea can be kept in aquaria and studied there. Lately, the seas can be observed with remotely controlled instruments (ROVs), or by remote sensing such as aerial photography and satellites. Submersibles have also become tools of science. man is more mobile at sea than on land: once in a boat, there is no need for roads. One can go anywhere. water is mortal to humans: deprived of air, humans die quickly when submerged. Water can also kill rapidly by cooling. SCUBA diving has its own hazards. The amount of time we can be in the sea is very limited. difficult to look through the surface: the surface of the sea is reflective, making it difficult to look down. Sea life is counter-shaded and camouflaged to avoid detection. Low level visibility complicates observation further. The cleanest ocean water has 50-100m visibility (viz), but clean air has 50-100 km! Most coastal waters have a viz of 2-10m. low level of knowledge of the sea: our knowledge of the sea has been obtained by perseverance, by working with the sea, from disasters and from fishing. Compared with what we know of the land, we know very little. The sea is also very strange. data is hard to obtain: because of poor access, and because the sea is deep and on the move, data is hard to obtain. Plankton organisms reproduce rapidly, while the water also moves them around. fewer people are studying the sea: only very few people are studying the sea, because of unfamiliarity, because we do not use it as intricately as the land, and because it is expensive and dangerous. use of the seas: the seas separate continents, and have because of this been regarded as a nuisance. fishing: first the coastal seas provided for enough food, but boats gradually went further afield, complete with factory ships to process fish at sea. They also progressively fished deeper and for smaller species. transport: as part of the migrations of people over the world, and because of trade, the seas have always provided the pathways for people and cargo. Free access to the oceans is therefore important. warfare: those countries with navies were able to project their power across the oceans, waging war and winning the spoils of war. mining: many minerals, particularly oil, are found under the sea bed. recreation: the sea has become a place of recreation, ranging from fun at the beach to ocean yachting. ownership: not long ago, nobody wanted the oceans. The only interest was for a strip along the shore. However, that has changed. vastness: the sheer size of the oceans means that it will always have places where people won't go; even places that have never been visited. Even today, little interest exist for those places, although the sea bed there may contain minerals. The law of the sea infers that these can be mined on a first come, first served basis. fluid environment: the oceans cannot be compartmentalised. They run across political boundaries. Coastal waters have all been nationalised, ending tribal ownership. Some fish (tuna, shark, billfish) migrate long distances, and across national boundaries. free passage: free passage (beyond 13 nautical miles) was essential for transport, trade and warfare. facilities: in order for transport to work, extensive harbours are needed for shipping (ports), complete with beacons, and surveying for charts. It has been agreed internationally who surveys which ocean areas. Ocean rescue has also been agreed on internationally. open access: until recently, the main ocean strategy was that of open access to its resources such as fisheries. However, this has led to uncontrollable overfishing and large fishing nations plundering other coastal nations. EEZ: the Exclusive Economic Zone has now been ratified as 200 nautical miles (370km) around sea-bordering nations, with an extension to 500m deep over the continental slope. Within this area, a nation has exclusive right to its resources, under the proviso that it exploits them maximally. For failing to do so, it empowers other nations to move in and to do it instead. f019624: yellow zoanthid anemones on a red carpet sponge, in New Zealand. The ocean has life forms that have not become terrestrial. f020710: A Diadema palmeri sea urchin at the Poor Knights Islands, New Zealand. 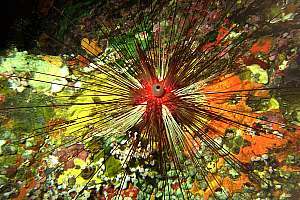 Sea urchins, starfish and other echinodermata are not represented on land or in fresh water. Triton's trumpet (giant triton) Charonia tritonis rare A very large tropical shell, reaching 40cm length. It is collected for the ornamental shell trade. Living in shallow water, these shells are easy to collect. In Indonesia, a survey of 133 sites on 92 reefs, found only 2 individuals. Protected in Australian waters, Seychelles and Fiji. Giant clam Tridacna gigas vulnerable The largest living shelled mollusc, measuring up to 1.3m and weighing over 200 kg, of which 60 kg is living tissue. Giant clams may live for 100 years or more. Giant clams live in shallow water and are easy to harvest for food. They are also collected for their ornamental shells. Fully protected in Australia, Papua New Guinea. Proposed for Appendix 2 of CITES. Coconut crab Birgus latro rare The largest terrestrial arthropod in the world, measuring up to 1m between stretched legs, weighing up to 3 kg. A tropical (hermit) crab, which has abandoned the sea, except that females have to return to the sea to lay their eggs. The crab is regarded as both an aphrodisiac and delicacy by islanders, who hunt it persistently. Also predated upon by introduced species like rats, pigs and monkeys. Fully protected on Aldabra (Indian Ocean). Further proposals for protection elsewhere. Threatened species: some tuna, some sharks, some salmon, all turtles, many sea mammals. Also read the section on oceanography which gives further background information on the physics and productivity of the oceans. For more details on marine habitats and living in the sea, read marine environment/habitats/introduction. Thorne-Miller, Boyce & John Catena (1991): The living ocean: understanding and protecting marine biodiversity. Island Press.